Don’t you just love to get mail? I don’t mean bills, sale ads, and political fliers, but a real, honest-to-goodness handwritten letter. I think that one of the most thrilling things in the world is opening the mail box to find a letter or card addressed to me! When was the last time you sent or received a letter? In this age of email, Face-book, and Twitter, it’s probably been awhile. It’s so easy to keep up with friends and family just by logging in and typing a quick little note. But, I have to ask….is getting an email or reading a status update nearly as exciting as getting a letter in the mailbox? For me the answer is no. My explanation for this is that to me, writing a letter is a little like creating a special gift for someone. First, stationary must be picked out. I usually try to choose a favorite color or pattern that I know the person that I’m writing to would appreciate. Next, time must be taken to carefully think about what to write. Unlike a computer, words handwritten on paper can’t quickly be deleted- especially if you’re using ink. Then, after the letter is finished and folded, a special memento such as a photo or bookmark can be tucked inside for a special touch. Finally, a trip to the mailbox or post office sends the letter on it’s way to delight it’s recipient. If you haven’t written a letter to someone for awhile, try it. It’ll make someone’s day to get a handwritten letter in the mail, and you’ll get the joy that comes from putting a smile on someone else’s face! So, I’m in the Nutcracker Ballet. I’ll give you a minute to let you picture that one in your mind… Alright, stop laughing! I obviously do not have a leading part in the production. I happen to be in a lovely party scene portraying the character of a guest. My costume is a beautiful old fashioned dress complete with a giant hoop skirt. Even though I am only a guest, it has been so much fun to join in with the dancing and acting. I love gliding gracefully across the stage and hearing the swish of the skirts during the “ladies star” part of the dance. There is one thing, however, that bothers me a little. It’s my posture. As those of you who know me have probably noticed, posture is really something I need to work on. On stage, I am terribly self conscious about it, and try my best to stand up nice and straight. Unfortunately, it’s hard to remember to do that and keep up with all the dancing and acting that I’m supposed to be doing. All to often, I find myself having to make a conscious effort to straighten up and stand tall. Do you ever find yourself being so busy dancing around with work, kids, school, chores, and all the other million and one things that occur from day to day that you forget to “stand tall”? Sometimes, I find myself being a sloucher in life. I know I’m slouching when I do things like snapping at my family because I’m tired, or making an excuse about why I can’t help a friend, or being part of a conversation that I know in my heart may be a little gossipy. Ever been there? Hmmm…..kind of a hard question, isn’t it? The truth is that having poor posture is ugly. Whether it’s on stage, or in our personal lives, it’s just doesn’t make us look or feel beautiful to be a sloucher. So, what can we do about it? For me, the best thing is to be aware that I have a tendency to slouch. Just like dance rehearsals are helping me to learn my part in the Nutcracker ballet, daily Bible study and prayer help keep my everyday dance of life a little straighter. Thankfully, God gives us some pretty clear instructions about how to stand tall and dance beautifully. When I find myself slouching, I can always go to His Word to find the encouragement I need. Psalm 121:2 says, “My help comes from the Lord, the Maker of heaven and earth.” That, my friends, is a reason to stand tall and dance, indeed. 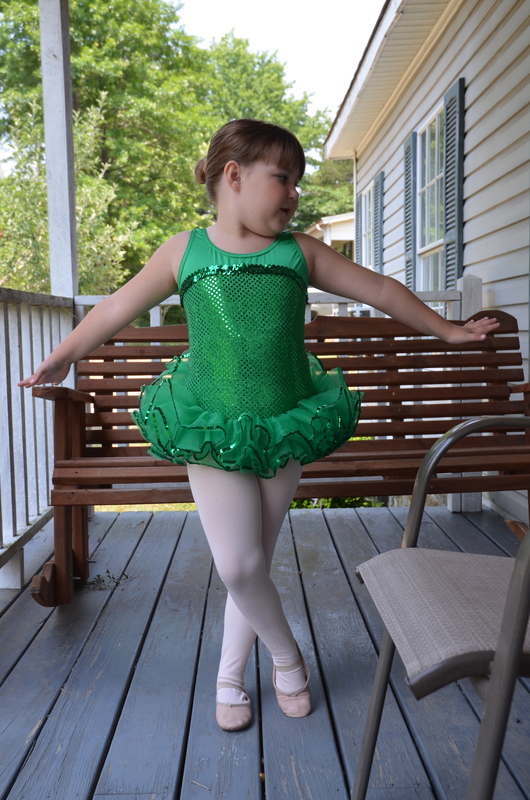 My little girl is the most beautiful dancer that I know.